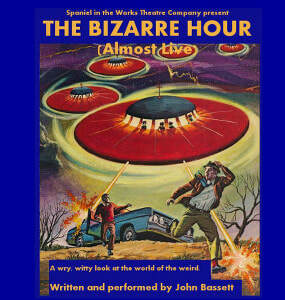 A lover of all things strange, bizarre or just downright peculiar John Bassett presents a lively new show offering a wry and witty look at the world of the weird. Based on stories gathered from three years presenting the Bizarre Hour on Stroud FM, this show looks at subjects as diverse as UFO abductions, conspiracy theories, organon and werewolf ointment. there will even be a chance to take part in Six Degrees of Wikipedia. Unfettered by the chains of broadcasting regulations there will be adult themes and possibly a few naughty words - in context. So come along for a show filled with bizarre facts, interesting tracks and maybe a little rant or two. May contain strong language, sexual references and nuts!